High Conflict Central – Win the battle, end the war! Win the battle, end the war! Because it is really about getting back to our lives and our kids and having a mentor to guide you along the way and listen to your concerns and understand your struggle can help you do just that! High Conflict Central is about parents connecting with parents to lend support. Nothing more, nothing less. Please read our disclaimer and keep this in mind as you read our posts. The information on this blog is based on personal opinions and insight. Our writers are not attorneys nor licensed psychologists. We are Divorce Mentors, Relationship Coaches and Alternative Dispute Resolution professionals. A majority of people struggling in Family Court are having issues due to a hostile ex or unhealthy relationship patterns. It has little to do with the law. None of the information or opinions offered by the authors should be considered legal advice. High Conflict Central and the individual writers who post are not rendering legal or other professional services through this blog and disclaim any and all liability to any person who reads this blog. We encourage readers to do their own research into the information that is provided. Readers should keep in mind that many things factor into court processes and cases can be quite different depending on where they are in the process and what has already been decided in their case. Personal stories are shared to raise awareness. Our purpose is to help people disengage from high conflict battles and move into a happier and healthier life, but is not meant as legal advice or therapy. If you need legal or psychological advice, please seek the help of those professionals. Our goal is to support you as you navigate systems and the professionals you meet along the way and to help you learn from our experiences in the high conflict divorces that we lived through. Who Do You Recommend for a Parenting Coordinator or Consultant? As someone who has been working for almost 20 years to help parents navigate the very choppy waters of family court, I get a fair amount of calls and emails from parents who feel overwhelmed with how off track their case has become. High conflict cases snowball into unimagineable craziness and parents desperately want to find ways to make it stop. Much of the craziness doesn’t really come from court. It really comes from the behavior of one or both parents. When you get sucked into the vortex of the land of upside down and backwards, AKA family court, there is little that the legal system can offer to fix it. Everything depends on the level of the cooperation between parents and their willingness to accept the reality of the situation and follow the prescripts that court professionals have to offer. Unfortunately, there is no magic fairy dust. There are no gold plated court orders that will make someone “follow the rules” or court orders. Parenting is not an exact science, whether a couple is happily married or whether they are angrily, hostiley, vindictively or hatefully divorced. The problem for divorced people is that you cannot put parenting on hold. Married couples sometimes alternate parenting between each parent because they do not fear the other has plans to take the children away, but divorced parents battle over who gets to do what, often because fear or hurt feelings are driving the parenting. Court orders cannot magically take fear or hurt feelings away. In many cases, parents work through their fears and hurt feelings, and divorce drama can settle down to a level that will make the situation workable for children and parents, but in the case of high conflict, the battle continues to rage without end. It is possible for the craziness to not only stay the same, but to increase. It happens because one or both parents are very rigid and demanding and they are unable or unwilling to look at how they contribute to the conflict. Until both parents can examine how they got to this point, there really is no way to move them forward. So, even though the real burden is always on the parents, desperate parents beg the court for help. Family court doesn’t have much to offer that will be of much help to you. They operate with no-fault ideas for divorce. You can blame all day long, but they don’t want to hear about it. Court operates under “the best interests of the child” doctrine, which means that the court has been elevated to the keeper of your child’s best interests, regardless of what a parent might think their child’s best interests are, and the most they can offer you is usually some type of mental health services. Even then, their options for mental health services in high conflict situations are a blend of law and psychology and sometimes, neither specialty does what it is supposed to do. If those areas don’t work together, but are in conflict with each other they add more drama to the mix. You end up being at the mercy of the biases and ideals that the professionals hold, often outside of court and outside of the application of law, but that is what they have to offer you if you cannot make it workable yourself. About the only thing they can offer, once the Judgement and Decree has been signed, sealed and delivered, is the services of a Parenting Consultant or Parenting Coordinator. The term Parenting Consultant is exclusive to Minnesota. The rest of the world calls them Parenting or Parent Coordinators. What these professionals do is to act as a neutral party, who will case manage the parents’ communication and conflict, try to help the parents cooperate and make agreements about the children, but they will also make a decision when the parents are unable to agree. It can be helpful, but it can also be a prison sentence. 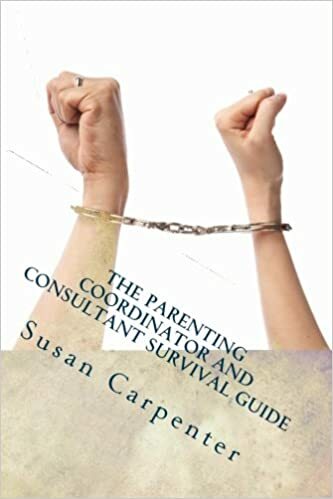 Because of my personal and professional background in family court, parents seek out my wisdom on who they should choose as their parenting consultant. Since I am in Minnesota, I know specifics about some of the PCs here. Because I work one on one with parents as a divorce and conflict coach or parent educator, I have seen samplings from many of our local PCs and I know how they think or react. That can be helpful when someone asks me who they should choose as a PC, but truthfully, you just cannot know how a PC will act in your case. Over the years, I have had favorite PCs. There have also been some PCs that I tell people to steer clear of. Still, it is a hard call. PCs can burn out. PCs can come up with ideas that they think are really good and then see that they go bad. PCs charge you a lot of money for their services and so if that is their sole motivation, they may enjoy seeing the conflict increase. Every so often I see a PC do a phenomenal job and I recommend that individual very highly, but then something happens and they do a terrible job on the next case. Did they suffer from burn out? Are they too overloaded with cases? Word gets around if they seem to know what they are doing. Did they get ill? Are they just tired of the pettiness? What you may not understand is high conflict is not only stressful for you, but also stressful for the professionals. I can speak to how difficult it is to witness some of the things parents will do to their child on a daily basis and be unable to do enough to put a stop to it or make the parent see their role in the conflict. Performing the role of PC is not easy. Being a prisoner (parent) of the role is frustrating, to say the least. What you must remember is this. The individuals who fill the role are human, just like you. They make mistakes. They get stressed. They have no magic formula to make people cooperate, treat each other decently, put their children first, or “follow the rules”. Your conflict may be different from the conflict they’ve managed in other families. While conflict is very similarly rooted, the underlying issues or triggers may be different. The interaction between parents may be very different. The histories between parents may be very different. The children’s personalities may be very different. Parent’s personalities may clash with the personality of the Parenting Coordinator/Consultant. A PC may be too passive to make a difference for you or they may be too aggressive to change an aggressive parent. You can never really know how things will go in your particular case. If you are planning to appoint a Parenting Coordinator/Consultant to your case or are struggling with one that you currently have, I strongly recommend coaching services. Your approach to the process and with the professional will determine how well it can work. Coaching can help you understand what is happening, especially when it makes no sense to you. For more information on why your family cannot move forward, contact us. We are always happy to see if we can make a difference for you and your child. Also, regardless of where you live, if you have any recommendations for a Parenting Consultant or Parenting Coordinator, leave a comment. Parents want to know about different professionals so that they don’t choose the wrong one. Your feedback may spare another parent from a lot of grief. Always keep in mind though, if a parent has approached the situation with ill intent, they probably will have a hard time with the PC on their case. Everything is about perception. Follow High Conflict Central. Our goal is to help parents make a better life for themselves and their children. You can read more about that here and here. We are assembling a team of divorce mentors around the country. If this is something you are interested in, either finding a mentor or training to become a mentor, contact us today. PC services are part of what is offered by Life’s Doors Mediation, a sponsor of High Conflict Central. Reach out to them if you are looking for PC services. To learn about the difference between a PC and a PTE, sign up for our free e-course on the topic. She is so adorable. I know it can be hard, but will you try to smile? One day at a time. Smile. For the Kids. Keep it low, OK? I think we are going to try recruiting Tiana as a divorced parent mentor. She has this figured out! What happens when you lose your focus? If you focus too much on the wrong things or if unexpected life events rob you of your energy and time, you will find that your other responsibilities get neglected. When that happens, everything can become very chaotic. Sometimes losing focus cannot be helped. For example, when my aunt became sick I had to put some things on the back burner, but she was my mom’s only living immediate family member so I thought it was important to take my mom to visit as much as possible. My aunt lived out of town so we took time every weekend to visit her, including one weekend that we stayed for four days because she was not expected to live through the weekend. She did make it through and actually lived another couple of months. What a fighter she was! It was worth neglecting things on the home front. Since then, both she and my mom have passed and I can look back without regret. Imagine if I had decided that housework and yard work were more important! Yes, during that time some things were ignored. Laundry piled up, the dust gathered, and the yard work did not get done, but I had my priorities straight. It was important to spend the time with my aunt and meet my moms needs, too. I knew that the chores could get done later. No big deal. Sometimes, you have to do what you have to do. What about times when you lose focus on what is important and then the important things get ignored? For example, I have a friend who obsesses over what her ex is or is not doing. She needs to clean up certain aspects of her life that are causing her grief, but she never gets around to cleaning those things up. She has a boyfriend, who thinks she is fabulous, but instead she alienates him by talking about how much she hates her ex husband. Wouldn’t it be better to focus on building this new relationship rather than lamenting the past? Consider where it is you want to put your energy and who you want to put your energy into. Exes are exes for a reason. The past is the past. Leave it there and live in the here and now while you plan for the future you dream about. I know a man who has a wonderful family, but he is a workaholic. His employer could live without him there 60-80 hours per week, but he thinks he must work that hard to get rewarded. Truthfully, companies rarely reward you with more than your salary. Ask anyone who has been laid off. Companies will always act in their own best interest when push comes to shove, and to hell with the employees. Especially when the economy is bad! The workaholic is missing out on his children growing up and being the kind of man that his children can count on to be there when they need him. As it is now, when his wife needs him or his children need him, he is never available. He is always at work. I don’t know what his future holds, but what I do know is that if his life were to end, his wife and children would most likely wish that he had given more to himself than to the company, or maybe, this is sad to say, but maybe they wouldn’t miss him much. If they are not used to having him around, the days after his death may be just a return to business as usual. When it comes to your family, don’t take them for granted. Be the kind of person who leaves a huge void when you are gone. Nothing is more important than family. Trust me, I work with people who have taken things for granted and lost them. It is a hard thing to watch someone go through and even harder to be the one going through it. Take some time, whether an afternoon, a day, a week or whatever time frame you need to figure out what parts of your life are most important to you. Once you have set realistic priorities, live it. Short of a temporary emergency or out of the ordinary situation, stick to your priorities. You will be glad you did. Put yourself at the top of your priorities list. If your love or energy banks are depleted you don’t have much to offer others. Eat, get plenty of sleep, and put together a good support system. Most importantly, do not be afraid to ask for help when you are struggling with something. Whether you have big dreams or just daily life expectations, be conscious of what it will take to meet those goals. Remember that some things are accomplished by taking small steps and that is okay. Meeting the goal is the important thing, but you have to make sure that it is an attainable goal. When goals are too lofty, you can end up disappointed. At the end of each day, think about the progress you made and recognize even the smallest advances. If you did not make progress toward your goals, forgive yourself when unforeseen circumstances or emergencies get in the way and then get right back to it tomorrow. If you need to, break big goals into smaller goals that will lead to the same thing. 4. Take time to relax and have fun. This is something you really have to allow yourself to do. Many people deny themselves and believe they are not worthy of a break. It is not true. Life is about balancing what you need to do with what you want to do. The world will not fall apart because you took your eyes off from its desires for you for a short while and remember, you are not in control of the world. Worry about what is your responsibility and don’t take on something that is not your concern. There really is nothing to feel guilty about. People who learn to say no usually get much more joy and fulfillment out of life than those who do not. If you don’t want to help your friend move, say no. However, if you want to help your friend and maintain the friendship, be confident explaining to them that you cannot do it that particular day, but maybe you could help in a different way. Maybe you help for a couple of hours or maybe on a different day (if they can arrange it). Maybe you offer to help unpack things and arrange things after the move. When you say no to people you care about, make sure they know that you are not saying no because you don’t want to help, you are saying no because you are not available at that particular time. If they are a good friend, they will understand. Try not to say no to your spouse or children though, unless it is an absolute must! It helps to write down the things you need to do and have a plan of action. It also helps to cross each item off the list when done. That way, you see that you have accomplished things and it keeps you motivated to do more! 7. Separate work from home life. Bringing work home with you, even if it is only the bad mood the boss put you in, puts your focus on the wrong things. You are likely not getting paid when you are not at work so why put your energy into that? Get rewards at home, such as the smile on your family’s face from receiving your full attention on them. Work is for work and earning an income to support your family, but home is where the heart is! 8. Schedule tasks that you don’t like to do, but know you have to do. Does the garage need a good cleaning? Pick a day and stick with that. However, the garage is part of the house so enlist family to help. You get to spend time together, sharing, while doing something that is a benefit to the family. It is also teaching your kids how to cooperate and share, even when it may not be the most fun thing in the world! We all should be making time for the important people in our lives, but we all need some time to ourselves, too. You may also want to spend time with friends and family as a group, to best utilize your time, but also, connect with each person individually as well. People need to know that you are interested in them as a person and if you only spend time with them in groups, it can create a wedge. Make time for you, for individuals and for group activities also, and do not forget how important couple time is for a couple who has children. Mommies and daddies need to connect without kids to keep their connection strong for sharing the kids. 10. Make it more about positives than negatives. Focus on what you have done, not what you were unable to get done. Focus on the few minutes you spent with your kids today, rather than the hours you did not get to spend with your kids today. Remember, tomorrow is another day and we never get to have every day go exactly as we plan or as we’d like! Before you go to sleep each night, reflect on what went right and what made you feel good. You will sleep so much better when you think in the positive! To be the strongest, most engaged parent one can be at this time when children need you the most, and, if necessary, to compensate for what is lacking in the other household. To shift the focus away from what is beyond your control and focus, instead, on what is. The information on this blog is based on personal opinions and insight. Our writers are not attorneys nor licensed psychologists. We are Divorce Mentors, Relationship Coaches and ADR professionals. A majority of people struggling in Family Court are having issues due to a hostile ex or unhealthy relationship patterns. It has little to do with the law. None of the information or opinions offered by the authors should be considered legal advice. High Conflict Central and the individual writers who post are not rendering legal or other professional services through this blog and disclaim any and all liability to any person who reads this blog. We encourage readers to do their own research into the information that is provided. Readers should keep in mind that many things factor into court processes and cases can be quite different depending on where they are in the process and what has already been decided in their case. Personal stories are shared to raise awareness. Our purpose is to help people disengage from the high conflict and move into a happier and healthier life, but is not meant as legal advice or therapy. If you need legal or psychological advice, please seek the help of those professionals. Our goal is to support you as you navigate systems and the professionals you meet along the way and help you learn from our learning about our experiences in the high conflict divorces that we lived through. © 2015-2019 by High Conflict Central, Susan Carpenter and Life’s Doors Mediation. All rights reserved.